Energy companies working in the oil sector are constantly in search of efficiencies that will lower production costs and raise productivity. Analyzing processes, capturing data, and providing meaningful feedback to increase safety and productivity is critical to lowering production costs and increasing profit. Check-6 provides a comprehensive program designed to provide Energy companies with onsite coaching combined with data collection and analysis, followed by detailed reporting to identify and correct deficiencies. Check-6 is there from beginning to end helping to improve the process by providing time tested methodology for moving oil rigs. Central to the process are the lessons learned from experience, opening lines of communication, and analysis of data to improve subsequent moves. For Energy companies operating land rigs, the most costly, dangerous and time-consuming aspect of drilling is the movement of the rig from one pad to another. Breaking down the rig into its component parts, transporting, and then reassembling the rig presents many extreme challenges. On a per-day basis, it is the most expensive phase of drilling. In addition to the normal expense of having the rig under contract, the Energy company also incurs a transportation charge. Depending on the size of the rig and distance traveled, the cost can range from $150,000 to $250,000. For rig personnel movement of the rig represents the highest rate of accident and injury during the drilling process. For these reasons Energy companies are continuously working toward achieving greater efficiency and improved safety during the move process. Deliberate Actions Enabled Predicable Results. Every rig move is different – each possessing unique daily challenges. Check-6 proven processes provide the customization necessary to achieve safe, efficient and predictable outcomes every time. 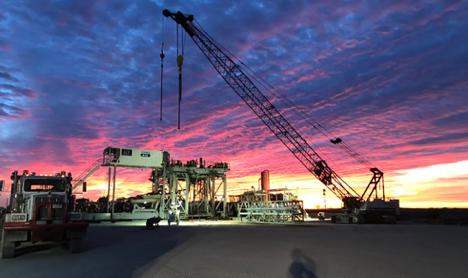 Our process of plan, brief, execute and debrief has worked for clients of all backgrounds regardless of rig type, locale, weather conditions or rig crew experience. Incorporating human factors and team development into the process, the experienced coaches tailor the approach to that specific rig’s needs. This equates to more wells drilled per year, with the same amount of resources, and a continual commitment to improvement. Operational improvements are gained without sacrificing safety – safety is always at the forefront of our efforts and Check-6 is a recognized industry leader in implementing a culture of safety and care while at the same time increasing efficiencies. If you would like to know more about this program and how we can assist you and your company, please contact Check 6 at info@checksix.com or calling +1.866.662.6656.